Raising and educating a child is a challenge, and WMHT can help. Using the latest research as our guide, WMHT children's programs are designed to address the educational, social and emotional needs of children in specific, narrowly-targeted age groups. Explore our list of age-appropriate children's television programs below (the American Academy of Pediatrics urges parents to avoid television viewing for children under the age of two). Or, learn more about children and media. WMHT provided screenings, craft activities, and visits with Clifford to families in Stepping Stones 1 in Lansingburgh, Schenectady Central Library, Lansingburgh Library, Crandall Public Library in Glens Falls, and the Gloversville Public Library. Learn more about the events here. Celebrate the excitement and surprise of spring with America's favorite monkey: Curious George! 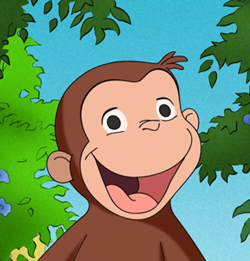 Catch the all-new PBS Kids presentation, Curious George Swings into Spring, on WMHT. Click here to view air dates and watch a preview. Recent tragic events have left the nation shocked, horrified, and speechless. The children in our lives still have questions and fears. As parents, grandparents and caregivers, we want to help our children and make sense of the words and imagery they are seeing on TV and other media. Over the course of decades, Sesame Street has been asked these very questions, and have put together a packet of materials in hopes of helping families cope with these issues. Those materials, available here (as a pdf), are free for you to download. 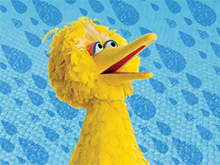 PBS KIDS is always working on something new—and usually several 'somethings' at once! Be among the very first to see what's new with beloved characters like Curious George, the Cat in the Hat, Buddy from Dinosaur Train, Sid the Science Kid and more at PBS KIDS LAB. Find lots of activities for at home and in the classroom. Dental health is essential to your overall well-being. 'Healthy Smiles' provides information, tips and techniques to improve oral health care for yourself and your family.